Review: Fuuka, Episode 1: Fuuka! You may have heard that I like Star Realms. Like, a lot. It’s fast, exciting, and inexpensive… sort of. The base game can be purchased for a mere ten bucks online, but I’ve sunk way more than that into expansions and storage boxes. 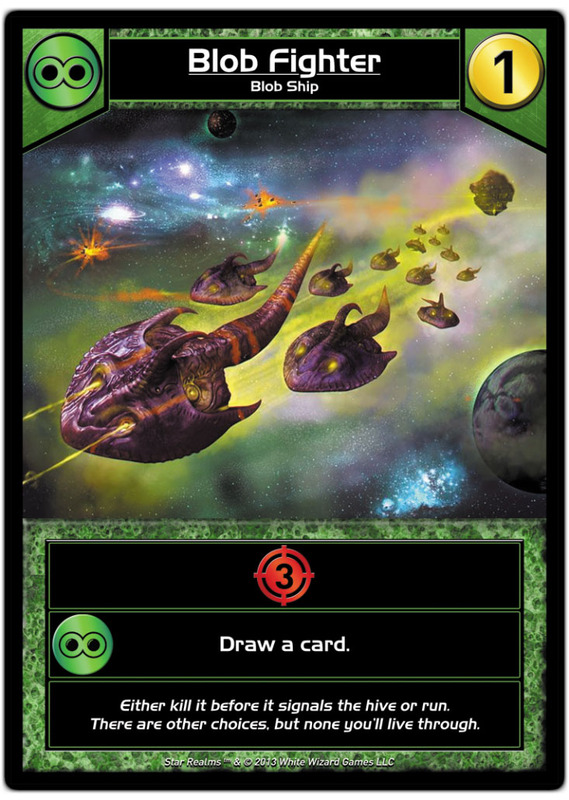 In this article, I’ll talk about how you can dive further into Star Realms, too. I’ll go through my opinions of each product available (in January 2017, at least). The easiest place to see a full list of these expansions is here, though keep in mind that you might find them cheaper from an online discounter like CoolStuffInc (or, since the game is already pretty cheap, you might want to support your friendly local gaming store). No matter which expansions and other complementary materials you buy, you need to buy either Star Realms or Star Realms: Colony Wars to get started. These packs come with a few necessary cards not found elsewhere, such as opening hands for each player and Explorers (an always-available card, not part of the main deck). Otherwise, the two sets are defined by their entirely different central decks. Both maintain the feel of each of the same four factions and can be combined, but they offer surprisingly different play experiences apart from each other. Colony Wars is a faster game, in my opinion, because authority (life) gain and scrapping (removing cards from your deck) are weaker, while the damage-heavy cards are even stronger. So, which do you buy? The short answer is: both, of course! 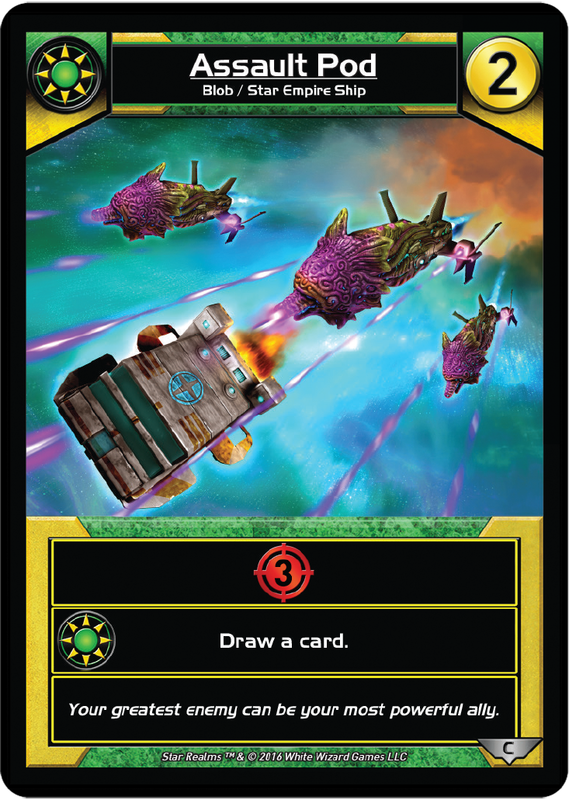 If you are wanting to try Star Realms’ multiplayer formats (it’s best as a two-player game, but multiplayer formats are fun diversions), you’ll need more starting cards. Rather than buy a redundant copy of the base game, you could buy each starter deck and play with up to four players. If the question is which to buy first, my best rationale is a bit “metagamed.” I would advise you to buy Colony Wars, because of the game’s app. The app is incredibly helpful, and you can play against the AI for free (more about this below). However, Colony Wars is not yet part of the app itself. By purchasing the game this way way, however, you can get a taste for both decks and a broader sense of the game as a whole. If you hate digital games, then I might still advise you to get Colony Wars first, simply because you might run into other local players, and they’re more likely to already have the base deck. I don’t find one deck particularly better than the other, so I push for diversity instead. On that note, I should point out that getting both base sets is more bang-for-the-buck than any of the expansions, so you may want to do that first. Conclusion: Buy both; Colony Wars first. The primary way Star Realms has been expanded is through (non-random!) booster packs, released four at a time. The first set of four were together labeled the Crisis expansions; the most recent four are called United. Each booster pack set has its own subtitle series. You certainly don’t need to pair Crisis expansions together or United expansions together; any Star Realms cards can be mixed into any starter set! I’m going to group these into four sets of two, arranged by the contents of the booster packs. These are the most basic of all eight expansions. They simply add more ships and bases to the trade row–essentially more of the same–while still changing the game considerably. The main decks for both starters are 80 cards, only 22 of the 80 cards cost 5 or more in vanilla (only 19 in Colony Wars). In these expansions, each color gets two of a more inexpensive card, and then at least one card in the 5-8 range (with one exception), including some awesome new 8-cost cards. This means the game now has far more super-powered cards to choose from, and, in my mind, this makes the game way more epic and awesome. There are also some really fun synergies around bases. There are cards that re-play bases, put them straight into play, or even punish your opponent for having too many of them. For people who like “more of the same” type expansions, these two packs are the ones to get. Between Bases and Battleships and Fleets and Fortresses, it doesn’t really matter which you buy first. 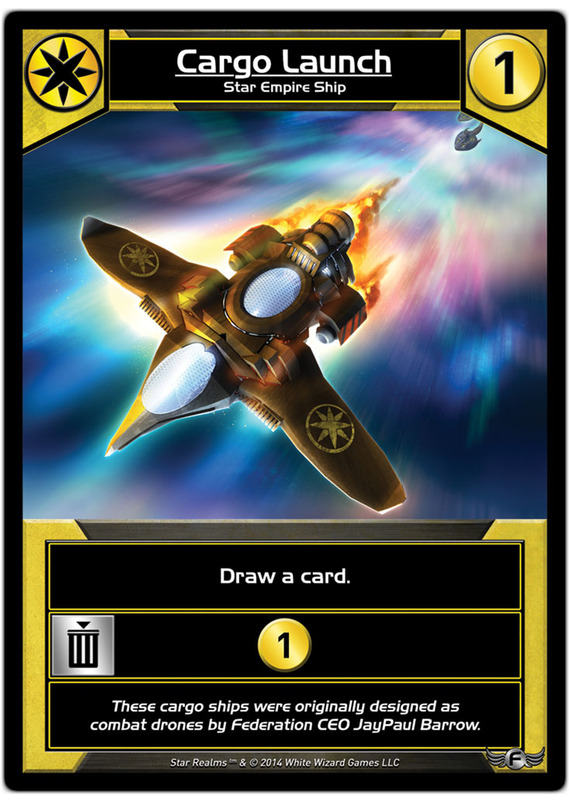 I would lean towards Bases & Battleships, simply because those three cards do a ton to make Star Empire (yellow) a better faction–a miniscule problem in the Star Realms base deck. These two expansions also simply add more bases and ships, but there’s a twist: all of the cards in these sets are dual-colored, meaning they belong to two different factions. This is a huge inherent advantage, because these cards trigger ally bonuses for either faction they belong to. For this reason, these cards are generally a little weaker by direct comparison (e.g., compare Assault Pod to Predator or Blob Fighter). However, some of the new cards have fun new abilities not found in other cards, such as Coalition Messenger, which lets you move cards from your discard pile to the top of your deck. And, again, these decks include a high density of awesome, expensive cards (which, strangely, are all bases). I would not buy these expansions before the Crisis bases and ships, simply because you might mistakenly be unimpressed after the “wow” factor of the dual-faction cards, even though the Crisis cards are extremely good. Heroes were first introduced as a new card type in Crisis: Heroes (big surprise!). These cards go straight into play in front of you, are not part of your deck, and cannot be attacked or otherwise manipulated by your opponent. All of the Heroes in the Crisis pack require you to scrap the card to get any use of it, and they offer a small bonus in addition to providing faction bonuses for one color for that turn. For example, my favorite, Cunning Captain, triggers Star Empire (yellow) ally bonuses and makes your opponent discard a card. Since all of these heroes cost only one or two trade to buy, they’re quickly snatched up and used at pivotal moments. The two Cunning Captains can be stacked together with other cards to pull off a discard-five that makes your opponent miss a whole turn! These cards change the game considerably with their immediate effects on the game. Both expansion cycles have one expansion pack that changes the game considerably. Events are mixed into the trade row and resolved for an immediate effect when revealed, and then scrapped. These cards can clear the traderow, deal damage or give authority to both players, or give players extra cards in hand. Depending on when they’re revealed, these cards can be hugely beneficial to you or your opponent, and they considerably amplify the randomness of a game that’s already got a fair amount of unpredictability. I’ve found that these cards can make games more swingy and therefore more interesting, and provide a possible “out” when you are behind, so I enjoy playing with them. However, they are definitely the most controversial expansion among players in the app. Missions are much less random, but still change the game considerably. These twelve cards are not included in the central trade deck. 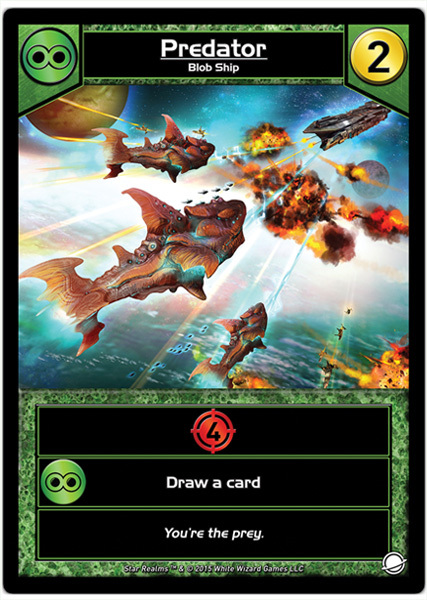 Instead, three are dealt to each player, giving the player a task, such as “play a Blob ship while having a Blob base in play.” When you accomplish the task, you reveal the mission (max one per turn) and gain a reward–drawing cards, extra damage, free cards, what have you. If you flip your third mission, you win. Were you about to be smashed by your opponent’s amazing deck? Too bad; game over! In practice, though, my third mission-flip has always coincided with my winning normally on that turn. These cards feel like “win-more” cards that reward you for already doing things likely to help you win, so I’m not sure how I feel about them. I suspect that, in much the same way that people do with Events, I’ll gripe but continue to play with Missions whenever I can anyway. Conclusion: Buy them all, but in the order I just listed (top to bottom). Gambits are another entirely new card type. These cards are dealt face-down (although they are face-up in the app) at the start of the game; each player gets two. At any time, you can reveal them, and scrap them for a purpose. (Some newer gambits do something upon revealing, and separately upon scrapping). They give more trade or damage, extra card draws, cards to the top of your deck, and many more abilities. I really enjoy playing with Gambits, because they allow you to adjust your luck. If you were dealt 1 Scout and 2 Vipers on your first turn, and there’s a 2-cost Cutter in the trade row, you can probably draw a card with one of your Gambits and make sure to get it. Some gambits are definitely better than others (looking at you, Frontier Fleet), so I always deal three and choose two when playing the physical game. I always choose to play with these cards if I can. Gambits are available in two different packs. The Gambit Set is more expensive, but also comes with cards for solo and cooperative modes, as well as 3 Merc Cruisers for the main trade deck. Merc Cruiser is an okay card, but I’m perfectly fine playing without it. Cosmic Gambit is cheaper, and only includes gambits. These gambits are also considerably crazier than the ones found in the original Gambit Set. Which one to get first depends on if you’re going all out. If you’re just going to test the waters, the Cosmic Gambit is more bang for your buck, especially if (like me) you have no interest in solo or cooperative play. However, you might find the original Gambit Set underwhelming if you pick it up second. Original Kickstarter backers received a set of promo cards, which are available as an expansion in the app (though the app expansion includes 3 Merc Cruisers, which are physically found in the Gambit Set). Now, there is a physical Promo Pack available for purchase, featuring the same cards with alternate art, and with the 3 Merc Cruisers replaced by 2 Security Craft (originally available through a Dice Tower Kickstarter) and 1 Mercenary Garrison (originally included with deck boxes). The main twelve cards are well-known to players in the app, and they’re a bit of a mixed bag. Personally, as a lover of bases, I think some of the coolest cards in the game are the four bases found in this set. There’s also an awesome ship that interacts with the bases (Battle Barge). However, two of the cards in this set (The Ark and Megahauler) are the most complained-about cards in the game. The Ark is the worst offender by far. It’s beatable, but it does warp a game to focus entirely around its existence while it’s in the trade row or in a player’s deck. I’m always happy to include The Ark in my deck, but I respect those who aren’t. I would still get this set merely for the other cards if you don’t have the original Kickstarer versions. However, you don’t need to be in a hurry to pick the Promo Pack up. You probably don’t want to play with The Ark until you understand the game anyway; it could accidentally spoil the game for you. Conclusion: Save this one for later. There are two main boxes available from Legion Supplies–a longer cardboard box that comes with plenty of sleeves, and a plastic flip box that doesn’t come with any (sleeves are sold separately). Both boxes come with Mercenary Garrison (1 in the flip box, 3 in the cardboard box), which is now also in the Promo Pack (I have like ten of these now). I own all of these items (boxes, sleeves) in various capacities. I will say that I really like the official sleeves, and will continue to buy and use them as new cards come out. However, I find myself strongly preferring the flip box. While you can’t find everything for a mega-deck in the flip boxes, they’re much easier to carry around and to transfer cards in and out of. Also, my cardboard box is starting to fall apart. Thus, I will continue to buy the flip boxes. Right now, I’ve got cards sorted chronologically–the base game, all Crisis packs, Year 1 Promos, and Gambits snugly in one box; and Colony Wars, the United packs, and Cosmic Gambits in the other. I will probably continue this strategy of fitting each “season” of Star Realms into its own flip-box. I do recognize that the cardboard box is better bang-for-the-buck, though, since sleeves are included. Conclusion: Flip boxes are better, unless you want everything mixed. The main reason I abandoned my Dominion addiction for Star Realms is the app. Dominion online is on its second owner, and is now a subscription model (yuck), and still a mess. Meanwhile, Star Realms is free to download and play against the computer, and the IAP to unlock it once on PC, iOS, and Android is a measly $5. Each expansion is a couple bucks, but they’re one-time fees that span all platforms. You really can’t get that kind of service anywhere else. The app does automate a few things that it “shouldn’t” (like ally-triggered card draws), giving you fewer choices and less strategy than the physical game at times. However, the app makes the gameplay very quick and smooth, and there’s an awesome online community here and here and here. I highly recommend that you at least download the app and play the free mode to see what you think of the game. Conclusion: Download the free version of the app, at least. Wait, there’s more? There’s always more… Star Realms has gotten popular enough to generate its own set of, shall we say, swag. There’s a T-shirt available here, which I own and can attest is a quality T-shirt, in that it… is a T-shirt. What more do you want? There’s also now a novel titled Rescue Run, available on Amazon. I can tell you that part of the action takes place on a Cargo Launch, a card which has been heavily memed in our Facebook group. Did the book inspire the meme, or the other way around? Read the novel to find out! Maybe! I’m Ready to Dive In! What Do I Do Next? Download the free app first and mess around. Get both base decks, maybe Colony Wars first. You can find ’em for ten bucks each. If you want to dive deeper, grab the expansions in the order listed above, though you can pick up some gambits to mix in at any point. When you need a storage solution, buy some flip boxes. Or, if you’re just going to mix everything, get the cardboard box. Considering you could have already played three games of Star Realms while reading this, I hope it was worth your time! Happy spacefaring!